This is a piece I will be showing at the Hamilton house pop up shop and gallery, which is running from this Wednesday to Sunday (June 5th to 9th). It was inspired by a Swedish folk tale about a boy who isn’t afraid of anything, and so when his family’s cow is stolen by trolls he doesn’t hesitate to venture into the forest to get it back. In the forest, he meets a few beings who try to scare him, but when he proves to be immune to them they decide to help him on his quest. The first being he meets is the Witch of the forest, with wild green hair. Here she is trying to be as scary as she can. 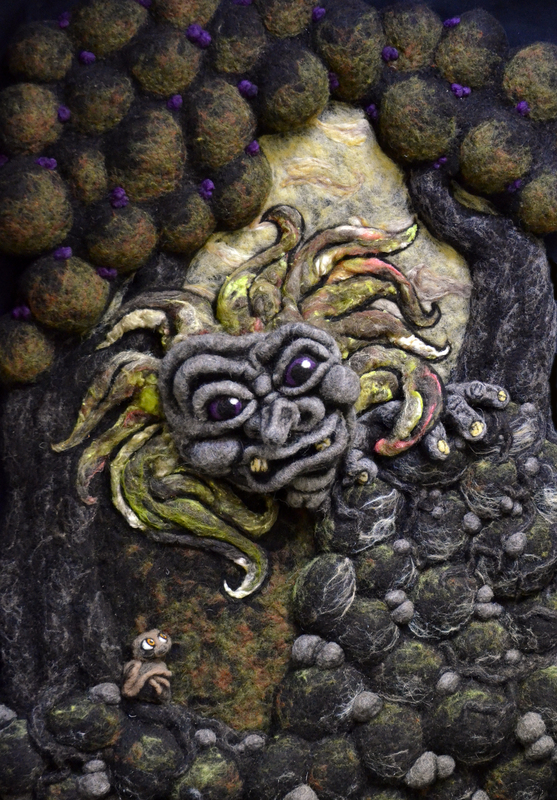 The piece is 80cm x 40cm and is entirely needle felted. At the pop up shop I will also be selling prints of this and other work, as well as greeting cards and figures. I thought people might be interested in how my work comes together, so I took pictures of the witch as I was making her. Here she is all the way from a weird Gonzo-like creature to her full glory.